In 2009, the Palestine Authority lodged an ad hoc declaration to the International Criminal Court accepting the jurisdiction of the Court for crimes committed since 2002. Almost three years later, the Office of the Prosecutor decided not to open an investigation on the situation in Palestine until the Assembly of States parties of the Court or the United Nations gives clarification on the statehood issue of Palestine. 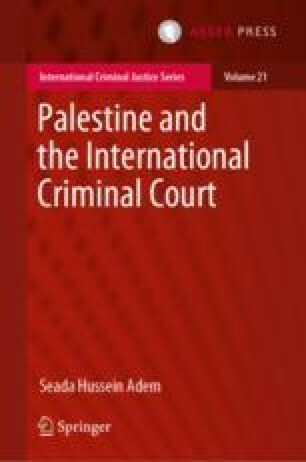 This chapter analyses the ad hoc declaration legal regime and the decision of the Office of the Prosecutor on Palestine’s declaration. It examines the route the Prosecutor employed in reaching the decision not to proceed followed by an alternative route that the author argues fits the provisions of the Rome Statute and the Practice of the United Nations. In addressing the statehood issue of Palestine, which the Prosecutor argued is a determining factor, the chapter discusses some key historical events that shed light on Palestine’s statehood, the elements of the Montevideo Convention and the theories of State recognition. The chapter also provides a functional approach or a practical route to deal with issues regarding ad hoc declarations in light of the aims and purposes of the Rome Statute. Amnesty International (2012) Amnesty International’s response to the ICC Office of the Prosecutor’s statement that it cannot investigate crimes committed during the Gaza conflict. https://www.amnesty.ca/news/news-item/ai039s-response-to-icc-prosecutor039s-decision-not-to-investigate-crimes-during-gaza-. Accessed 17 February 2016. Mendes E (2010) Statehood and Palestine for the purposes of Article 12(3) of the ICC Statute: A contrary perspective. https://www.icc-cpi.int/NR/rdonlyres/D3C77FA6-9DEE-45B1-ACC0-B41706BB41E5/281876/OTPErrolMendesNewSTATEHOODANDPALESTINEFORTHEPURPOS.pdf. Accessed 17 February 2016. Republic of Côte d’Ivoire (2003) Declaration accepting the jurisdiction of the International Criminal Court. https://www.icc-cpi.int/NR/rdonlyres/57B00915-8FDF-4532-9BDE-8AF338E3E364/279844/ICDEENG7.pdf. Accessed 13 February 2016. Republic of Côte d’Ivoire (2010) Confirmation de la declaration de reconnaissance [confirmation of the declaration of jurisdiction]. https://www.icc-cpi.int/NR/rdonlyres/498E8FEB-7A72-4005-A209-C14BA374804F/0/ReconCPI.pdf. Accessed 13 February 2016.